When you can't decide on the right office massage chair for your needs, going with a top-rated manufacturer is a must. All it takes is going through its bestselling products and making a decision. 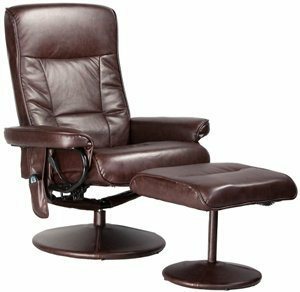 With so many Relaxzen Massage Chair reviews out there, it's easy to tell what makes this recliner chair a front-runner. Its price tag puts it in the middle range of this spectrum, but without compromising on quality. You got no bells and whistles, but just the right features and a few extras for optimal comfort. Who Is This Massage Chair For? The Relaxzen massage office chair is practically a hybrid. It's an innovative office chair, as well as a simplistic, yet well-featured massage chair. You can mix two activities simultaneously – office work and relaxation. It's much more qualitative than a classic office chair, but it also carries the most common features of a massage chair. It doesn't come with any bells and whistles, innovative technologies and futuristic therapies. Instead, it's focused on what matters – comfort and relaxation. We had the opportunity to test this massage office chair, so here's what we found out. The funny part about office chairs is that they're meant to feel comfortable, especially around the back, yet they're only useful for sitting. This model is different. You don't necessarily have to work or be around your desk to use it. How about just chilling in front of your TV or while reading a book? The extra massaging features add to its comfort standards, while the office design makes it suitable for most rooms. Unlike most massage chairs, it's not a bulky piece of furniture that you can barely move around. Instead, it looks like a traditional office chair with extras. You can recline the backrest and take a nap, rest your legs on the ottoman and even swivel around – quite useful when reaching for beer and popcorn... Err, we mean office papers! Just like you have probably guessed already, you can adjust the height. All in all, it's comfortable without being overstuffed. Most reviews claim that this is an ultramodern office chair. It's an office chair that can massage you as you work. Simple like that. Its settings are simple and straightforward, even if it's the first massage chair you use. The model has its remote control – nothing fancy, but even simpler than a TV remote. You have a few settings on it, such as choosing which part of your body needs some pain and stress relief. While you can get a general massage if you want to relax, you can just as well target the calves, thighs, lower back or upper back. Choose one, two or all! We tried all the possible combinations in a cocktail of massages, and they work like advertised. If you're not sure what kind of massage you'd like, choose one of the preset programs. One major plus we found – you can set the duration. You can't do that in most massage chairs. They usually stop after 15 minutes – quite inconvenient if you're trying to nap and your chair goes in the upright position in the middle of it. Apart from the preset massaging programs, it's worth noting how the system works. It's less likely to fail on you because it runs not less than eight powerful motors. Each of them targets specific areas. You can choose one or another to be a priority, yet the preset modes are general. In other words, you'll need to learn how to customize your programs. The heat setting is operated with an extra motor. All these features can be controlled with a simple remote. Store it safely in the pouch on the right side. The ottoman is included in the package and works as a separate unit. It's not fitted to the chair so that you can place it at the optimal distance. It's connected through a wire, so it can also be controlled through the remote. It has its massage feature based on vibrations. In other words, you can get a full massage from head to toes. Heat therapy is a new thing in massage chairs. It was implemented a few years ago though, based on scientific research. Heat relieves stress and pain – simple like that. This model comes with heat therapy that works independently. You can relax with a massage and take advantage of faster stress relief by turning the heat setting on. You don't have to be in pain to use it though. It's as good for those cold winter days, not to mention warming up achy bones. It's even better for elders and those who suffer from arthritis. We'll be honest with you and mention a small drawback too – the lumber heat setting only works when the massage is on. Sometimes, you want to work or read a book and feel cozy – not going to happen unless you get a massage too. It would've been handy if Relaxzen added heating for other parts of the body too. If you like to look at other brands, click here. 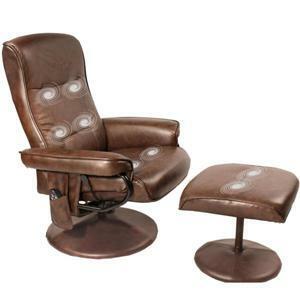 The Relaxzen reclining massage chair and ottoman set are covered in simulated (artificial) leather – as durable and good looking as real leather. Apart from the brown leather, it's also available in black and camouflage designs. Regarding framing, the user will be supported by a tubular design made of steel. The base is also made of steel. Overall, you have a sturdy, yet lightweight chair – just over 57 pounds and easy to move around. It fits people of multiple weights and heights. After all, you want to know if you're going to fit in it. Luckily, it will take people of up to 300 pounds in weight. As for height, it's ideal for a medium sized person, yet the adjustable height makes it suitable for both short and tall users. The sitting area measures 21 x 22.5 inches, while the backrest has 22 x 27.5 inches. It also comes with a one-year warranty. Here, we have listed down what do we like about the Relaxzen, and also include what can be improved because every perfect massage chair lies certain flaws. 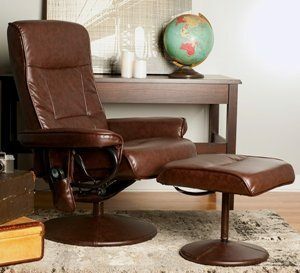 Its versatility is a major attraction – looks and feels like an office chair, but it has extras to turn it into a massage chair, as well as an ottoman. Given the price tag, it's one of the most affordable massage chairs on the market. In the office chair segment, it goes in the middle range. It's compact and can fit anywhere – small rooms, flats, living rooms, small office, bedrooms, study rooms and so on. It's the size of a classic office chair. Based on its size, it's apparently not as bulky and heavy as traditional massage chairs so that it can be moved around without extra help or being disassembled. Lumbar heating is efficient and fast. The base is not solid enough, so you might fall if you lean too far. Vibrations from massages are not subtle and can become noisy during long massaging sessions. Simply put, Relaxzen's office chair is recommended to anyone who works in an office or from their desk at home. As long as you spend more than a few hours a day working in a sitting position, chances are this chair is for you. 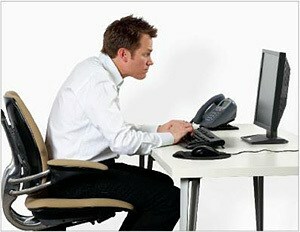 We all know what happens to office workers – they lack lumbar support, so they end up with massive pains. They need to stand up every hour and stretch a little, while some of them require leg support as well – especially the short ones. You don't necessarily have to wait until you feel pains to invest in a quality chair. It's a medical recommendation and not just for office workers. Most people spend on average 2-3 hours a day in front of their computers or laptops. They use regular chairs instead of proper office chairs. Sometimes, they sit on the couch or their beds in the attempt to feel more comfortable – not going to happen. Without optimal support, not only you'll experience pain, but you'll also lose your productivity. Even if you don't need an office chair, having a massage chair at home to relax after a long day at work will work wonders for your health. Based on the amount of Relaxzen Massage Chair reviews we found online, there are no doubts about it – this is one of the best-selling office/massage chairs out there. Overall, we rate it at 4 out of 5 stars. Around 70% of all buyers rated it to be perfect or almost perfect. We couldn't agree more!